Corinthia, Corinth AR Drachm. Circa 4th Century BC. 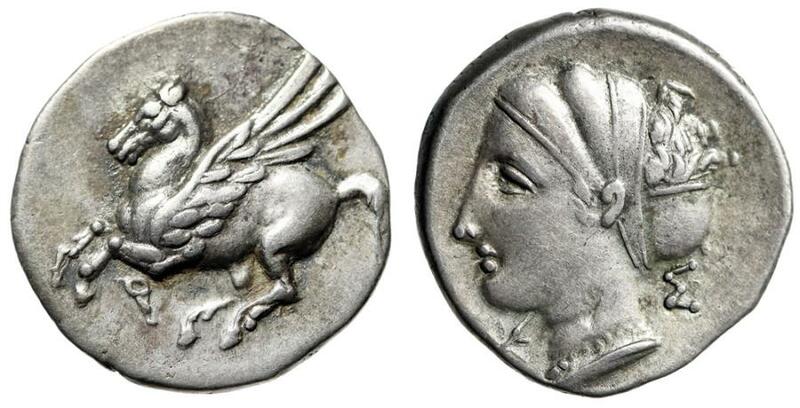 Obverse: Pegasos flying left, Koppa below. Reverse: Head of Aphrodite left, wearing sakkos, pendant earrings and necklace; Retrograde sigma behind, uncertain object in lower left field. References: BCD Corinth -; SNG Copenhagen -; BMC – Extremely Rare. Size: 16mm, 2.40g. Professional Numismatic Notes: Choice EF with a beautiful old-collection tone! These controls are unpublished as far as I have seen and extremely rare! Exceptional state of preservation for these!